This section for freshwater fish recipes is divided into types of fish as well as recipes. Freshwater fish is a term that's self explanatory - they're river fish as opposed to sea fish - bit simplistic as salmon spend time in the sea - but you tend to catch them in the river. On the whole, they tend to be a bit bony - apart from salmon and trout which are in a class of their own. I think one of the best ways of eating freshwater fish is to barbecue at the side of the river or at your campsite if you’re on holiday. 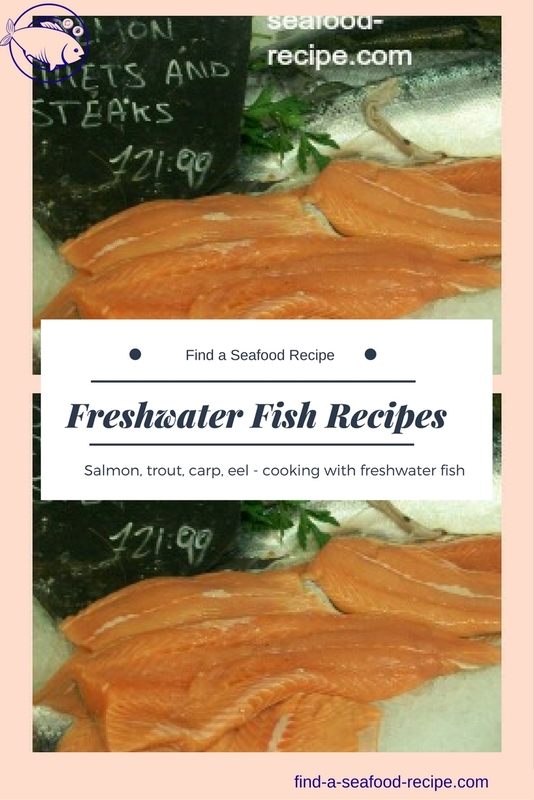 The majority of freshwater fish recipes are for salmon, trout and their varieties – I will publish other recipes as I find them. Other methods of cooking freshwater fish recipes are baking, poaching, grilling, boiling, stewing, frying, deep frying and braising. If you don't want to catch your own, then the best wild alaska salmon is available here where you can read and see videos about catching salmon. Grows to 10-16 inches (25-40cm) in season in the UK June to December. Imported all year. Good eating, but bony. Suitable for any method of cooking. 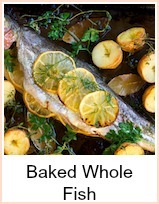 Baked Bream with a distinctly mediterranean flavor - tomatoes, black olives - mmmm... this would adapt for any medium sized whole fish. Grows to 15-20 inches (37-50cm). Available all year except April and May. It has white flesh with a good flavor. 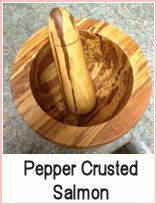 It is best baked or poached, but can be used in any method. 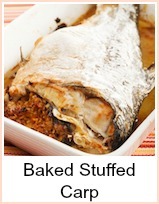 Tasty stuffed carp - this method can be used for any whole fish, just adjust the cooking times according to the size. Grows up to 36 inches (90cm). Available all year but best in autumn (fall). It is best to buy them live - hit them on the head to kill them – then skin and cut them up - personally, I couldn't do it. It is very bony - grill, fry, bake or braise. 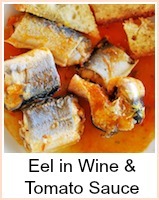 There is a good eel with wine and tomato recipe here. Grows to 6-12 inches (15-30cm). Available all year except March and April - best in summer. Good taste but bony. Suitable for all methods of cooking. Perch with parsley sauce - an alternative to bbqing at the side of the river. Monsters of the rivers and ponds - grow to 2 feet (40cm) and have seriously scary teeth. Available all year - very bland, tasteless and bony - but if you've caught one and you’re determined to eat it, then try poaching it in a sauce - maybe wine and tomato. It's more popular in France and quite often roasted, spiked with garlic slivers. Most people consider salmon to be the king of fish - I like it, but I prefer trout - it's got a more delicate flavour in my opinion. 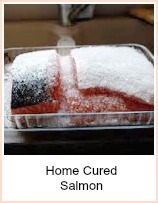 You can buy salmon all year round - normally farmed. 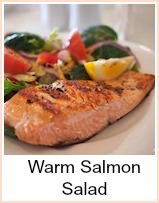 If you can get wild salmon then you'll see the difference - the flesh is much firmer. 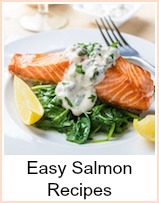 If you look below, you will find some links for more tasty and simple salmon recipes. Trout come as Brown (mostly what you would catch yourself in the river) Rainbow Trout - the ones you would normally find at the fish counter and Salmon Trout - related to Brown trout, but larger. You can buy farmed trout all year round, but wild trout is generally available from February to August or September. It's suitable for most methods of cooking, but don't waste its delicate flavour in overseasoned sauces. 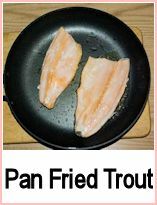 There are other trout freshwater fish recipes on the site - the search box at the top will find them for you. 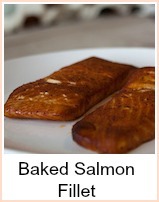 A really simple baked trout, quick and easy. It would be suitable for any medium sized fish that you may catch. 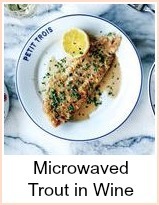 A microwave method of cooking trout in white wine - ready in a few minutes. A delicate flavored fish like trout needs few cooking additions. This simple pan fried dish doesn't interfere with the flavor. A selection of trout recipes including a video showing you how to make baked stuffed trout and some information on mercury levels in fish. A huge selection of freshwater fish recipes. Salmon, trout, carp, eel and many more. 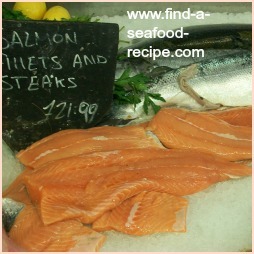 Great ideas for cooking your catch of the day as well as superb dinner party recipes and family recipes. 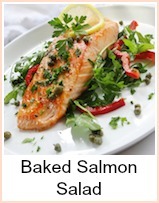 Salmon is considered the King of Fish and you will find simple as well as luxurious recipes here. 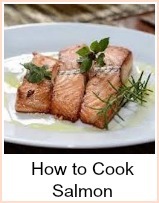 2 part tutorial on cooking Salmon Easy, foolproof method, step by step instructions with photos. 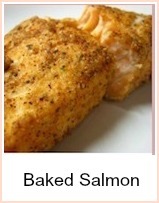 A simple recipe using dijon mustard and breadcrumbs for a delightful crust to the fish. 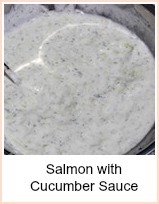 A simple sauce to go with baked salmon. 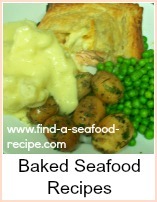 Easy recipe which would be a healthy family meal or an impressive dinner party main course. 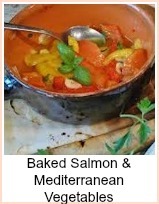 An easy one pot dish - mixed vegetables and salmon baked in the oven. 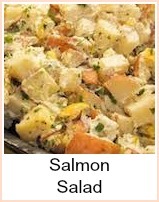 Served with a salsa and piquant dressing this is ideal as a salmon appetizer or main meal. Delicious pan fried salmon in a crispy coat of blackened spices. Quick pan fried fillets of salmon one with a tartare cream and the other with a mixture of beetroot and peas. 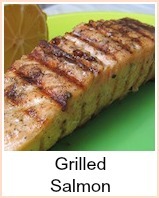 Delicious grilled or barbecued. The marinade will give a lovely blackened crust to the salmon. 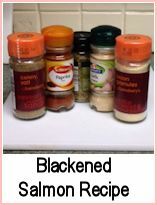 Use a similar mix for a salad dressing to accompany this dish. Quick and simple to prepare. Grilled salmon with a crushed black pepper crust. 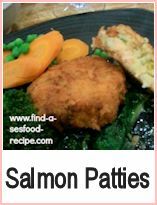 Salmon fishcakes using fresh or canned salmon. 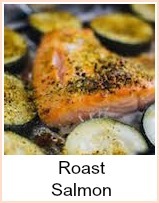 Simple one dish roast meal - lovely mixture of roast vegetables with salmon steaks. 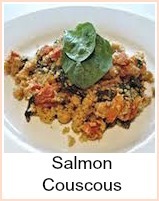 One pan dish - spicy salmon couscous - quick and simple to prepare. 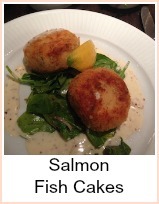 Lovely salmon fish cakes with a crispy breadcrumb coating. Salmon, prawns, potatoes over watercress with a dill dressing. Ideal for a buffet. This is a lovely salad recipe - serve either warm or cold. 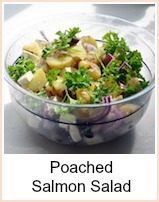 Another delightful salad - serve with some crusty bread to mop up the juices.